Price reduced on this beautiful used 35' Cabo yacht for sale in Florida! 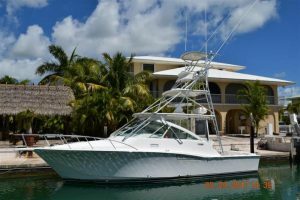 : Atlantic Yacht & Ship, Inc.
Word from Bill Leonard brings news of a a price reduction on the beautiful used 35′ Cabo yacht for sale in Florida! In the first place, this used 35′ Cabo was launched in 2004. As can be seen, this used 35′ Cabo yacht has been one of the most popular boats ever launched by Cabo. This model has a great layout and lots of enjoyable upgrades. Furthermore, she features sleeping accommodations for up to four adults. Additionally, she has a well-equipped galley and a spacious full-sized head! Beyond the fantastic cabin, this used 35′ Cabo yacht also features a nice helm deck with lots of seating. Similarly, the large cockpit is loaded with every possible fishing amenity. Known as “Jenny,” this used 35′ Cabo is a superb example of a condensed fishing yacht. She is rigged with a full tower and top of the line electronics. Likewise, she has all new eisenglass along with almost every factory option one could want. You will love her Caterpillar diesel engines with only 100 hours! For more information on this beautiful used 35′ Cabo yacht for sale in Florida be sure to contact Bill Leonard today! Price reduced on this beautiful used 35′ Cabo boat for sale in Florida! Price reduced on this beautiful used 101′ Hargrave yacht for sale in Florida!